Over the past couple years, Corey Red & Precise easily qualify as the most sought-after duo in hip hop without a solo project. The heavily pursued New York based crew has been on numerous mixtapes and compilations, along with touring on the recent Evolution II Tour with Men of Standard and Tonex, among others (see tour recap). After years of anxious anticipation, the duo fills the proverbial musical gulf with their debut release, Resistance Iz Futile. This 19-cut escapade is chock full of rugged and raw tracks that serve to backdrop the potent and powerful lyrical delivery of Red & Precise. It would be too easy to compare this duo to Redman & Method Man. After all, both duos have an amazing street vibe and a lyrical intensity second to none. 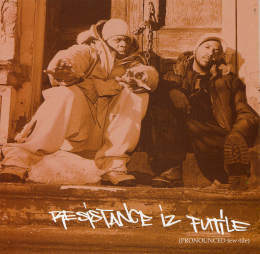 Yet, Red & Precise's flow is laced by the Holy Spirit, and their lyrics bear witness to this. The leadoff track, titled "Bump In Da Night", gives outstanding insight into the potential of the duo. The vibe is straight East Coast and scratches that musical itch to nod your head to a gritty street track. "The Martyr's Anthem" has Todd Bangz (catch his Bang Theory album review) taking production duties. He does a fantastic job in support, as Red & Precise stress the importance of maximizing every moment of life and reflecting Christ with every decision in life. Bangz also adds his production to "Lyrical Biblical". The result? Another hit. The hit producers keep coming as Maji from The Yuinon lends his influence to "No Grey Lines" and "Propaganda". Lee Jerkins of the RockSoul family handles production for "What's Goin' On" along with "The Passion". "Da Matrix Joint" appears on this project after its initial appearance on the RockSoul Urban Compositions project, where it was titled "Wild Style". Again, the partnership with RockSoul and Red & Precise is as successful as peanut butter and jelly it just flows! Now, we know that producers don't show up if artists don't deliver. Well, believe all of the hype because Corey Red & Precise bring nothing but heat to their debut. "Q & A" is seemingly the sequel to Jadakiss' recent hit "Why?". The difference here is that Red & Precise challenge listeners to think of what one question they would possibly ask God if given the opportunity. The questions posed are mind boggling and the proposed answers are interesting. "Gethsemane" begins with a classical feel, but soon morphs into a bumpin' track featuring that infectious beat found on the Mary J. Blige classic "Real Love". And lyrically, this is hip hop's equal to The Passion of The Christ movie. It's a descriptive piece that describes Christ's experience in the Garden of Gethsemane and brings continued life to this crucial moment in history. Of all of the amazing songs on this album, the most notable offering is the much needed "Prayer 4 Hip-Hop". 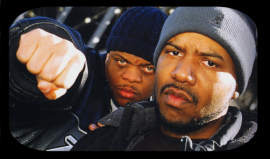 On this one, Red & Precise go acappella and move more into a spoken word format as they pray for hip hop and mainstream giants, ranging from R. Kelly and DMX to Lil' Kim and Foxy Brown. In their prayer, they speak of the importance of properly reverencing Christ while admonishing many not to run from God's call. It's strong, and is bound to impact hip hop as we know it. This project was worth all the wait and is worthy of all of the hype. 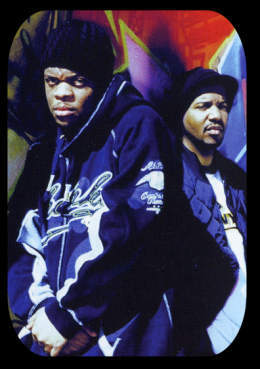 Holy hip hop's grittiest duo has brought the pain and continues to make a significant impact. You can't run away from this one. Resistance Iz Futile.